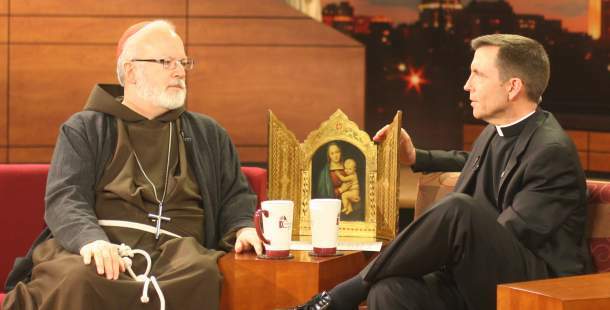 During Holy Week, Cardinal Séan O’Malley will discuss Haiti and relief efforts on CatholicTV. Cardinal O’Malley has a regular show on CatholicTV called “Conversations With Cardinal Sean” which involves interviews of Cardinal Sean talking about a wide range of topics from hot subjects such as stem cell research and abortion, to memories of how the Cardinal realized his own calling from the Lord. In March, Cardinal O’Malley travelled to Haiti to assess the needs of the Church there along with fellow clergymen. Tuesday at 1pm and 6pm, Wednesday at 12:30am, Good Friday 10:30am and Easter Sunday at 3:30pm. Conversations with Cardinal Séan takes viewers into the mind of a man who studied 7 languages, wears sandals during the Boston winter, and once voluntarily lived in a prostitution and drug-infested slum in order to experience and alleviate the sufferings of oppressed Washington D.C. tenants. At the age of 12, then-named Patrick O’Malley entered the St. Fidelis Minor Seminary. . According to “Current Biography Magazine”, a fellow student at St. Fidelis said that "Most of us were ballplayers hoping to be priests one day. Sean was a little priest the whole way through . . . he was a little Franciscan the whole way through. He was the real thing from day one." Happy 25th Anniversary World Youth Day!